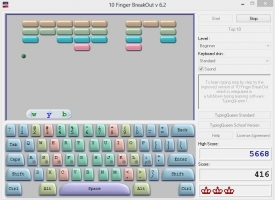 "A game to improve your touch typing." 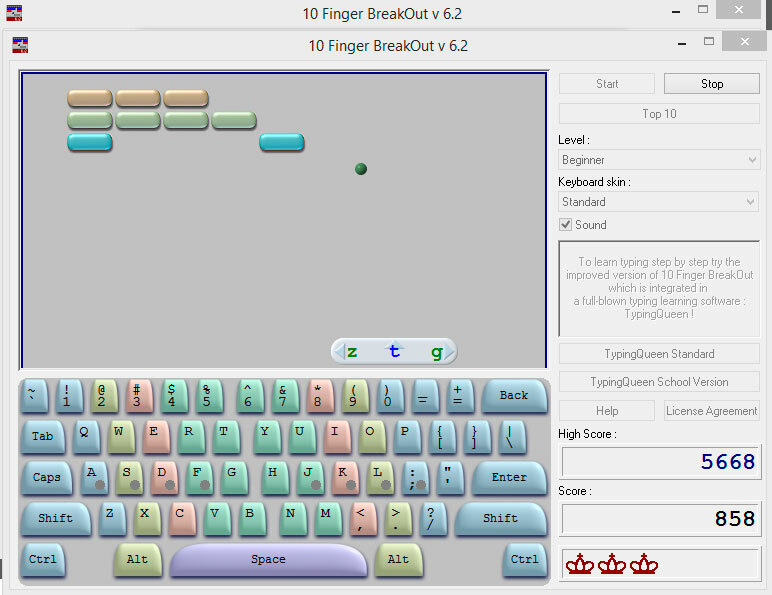 10 Finger BreakOut is a game to improve your keyboard and typing skills, you control a cursor at the bottom of the screen using certain keys to move left and right which change each time you move a little so you must have fast fingers, the letter in the middle of your cursor fires off another ball to blast away the blocks at the top of the screen. The game runs very slow and although it’s a good idea to help you learn where they keys are on the keyboard if you are already a proficient typist then 10 Finger BreakOut Free Download can become quite boring quite quickly. It may be very useful for those you who are learning to type more rapidly and for kids to make learning where the keys are on the keyboard a little teeny bit more exciting. The game is not particularly challenging especially once you realize you can fire balls out and blow the blocks away rather than just using the bouncy ball to knock the blocks away, there has been many similar games to this before but the slow pace of this one makes it a fairly tedious experience after a few minutes, there seems to be no increase in difficulty when you move up a level and with no challenge there is no reason to want to come back to play this game again. If you are trying to improve your typing or learn where the keys on the keyboard are without looking then perhaps give 10 Finger BreakOut a try by downloading it free here.